Since voters are unhappy with both the Central and state governments, Congress’s Karti Chidambaram may have the upper hand over BJP’s H. Raja. 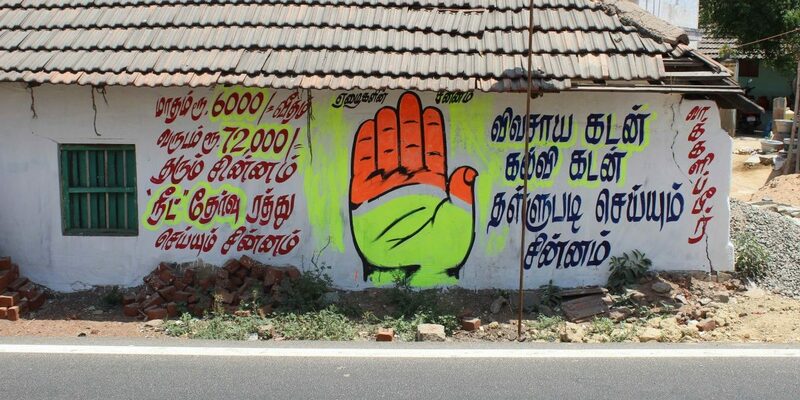 Congress campaign material painted on a wall. This is the first article on a two-part series on the Tamil Nadu elections, reported from Sivaganga. Sivaganga (Tamil Nadu): In a world where people often speak in terms of a “wave (alai)” to refer to the direction people are looking in politically, at first glance this election in Tamil Nadu appears to be as flat as the Cooum River that dribbles somewhat lifelessly through Chennai. Scheduled for the second phase, on April 18, this will be the first election since the passing of two towering wave-makers: J. Jayalalithaa’s death in late 2016 after months in hospital was followed shortly by M. Karunanidhi’s illness and withdrawal from public life, leading eventually to his demise in August last year. With their respective burials in the hallowed sand of Chennai’s Marina Beach, the gates of the great Dravidianist pantheon appear to be closed at the moment. After a season of protest and discontent about jallikattu and environmental issues that no major party was able to contain or direct, the Dravidian parties are nevertheless playing the role of gatekeepers for the national parties, neither of which has a strong grassroots presence in the state. While the DMK’s alliance with Congress has the virtue of at least adhering to a common ideological programme of secularism, the AIADMK’s docility in office since their leader’s passing and its work in the service of another Modi victory strike most voters as purely opportunistic. DMK president M.K. Stalin comes closest to representing the Tamil region’s Dravidianist ethos. But he has proven to be a less inspired, and hence much less inspiring, leader than his litterateur father was. The 18 assembly by-elections that are taking place simultaneously with national polls are being watch just as closely as the Lok Sabha. The future of the current state government hangs in the balance. In such a context of disarray, the language of waves often fails us. In order to take into account less easily apparent currents, countercurrents and eddies that will ultimately define results in an election where the opposition is only partially able to benefit from anti-incumbency, a more fine-grained analysis is required. The perspective offered here is a ground report from Sivaganga Lok Sabha constituency, which consists of the district that goes by this name as well as recently-added southern sections of the erstwhile princely micro-state of Pudukkottai, including the region known as ‘Chettinadu’. Here, the national parties are battling it out in a rural Tamil heartland that has been ravaged by cyclone Gaja, parched by falling water tables after a failed monsoon, riven by sporadic caste violence and marked by high unemployment among a youth increasingly dependent on opportunities in Southeast Asia or the Gulf countries for income. Sivaganga’s problems are representative of large swaths of the southern parts of the state. But this is one of only two constituencies in Tamil Nadu where the Bharatiya Janata Party and Congress are contesting directly against one another. The other is Kanyakumari, which has a much deeper history of communal politics. In the taluk town of Alangudi, once known for its peanut mills, Edappadi Palaniswami was making yet another speech from the campaign van in what must feel like an endless series of stops in small farming centres in the dry southern districts. Whatever Modi ripples passed through Tamil Nadu in five years ago have long subsided here. The chief minister of Tamil Nadu already has a difficult job campaigning because he assumed office not through the popular will but because of the death of his AIADMK’s much beloved and feared Jayalalithaa. In this case, he had the added burden of speaking in support of a candidate few people know very well in these parts, which were annexed to Sivaganga constituency only in 2009: Karaikkudi’s former MLA H. Raja, the BJP Lok Sabha candidate chosen through a deal cut for an alliance with the state’s ruling party. For those who do know who H. Raja is, he has become infamous. Voters who follow the news are likely to have a heard about his attempts to play divisive communal politics in a Dravidian land that has so far been more resilient against the onslaught of Hindutva than many other places in India. His name shot to prominence, for example, after a tweet suggesting that Periyar statues in Tamil Nadu will be next, after the new BJP government in Tripura started knocking down statues of Lenin. (Someone, in fact, made good on his threat by smashing the head off of the Periyar statue in Alangudi itself, where Raja was campaigning.) Raja later apologetically claimed that these where not his words but those of the account administrator, in reaction to public furore. But Raja resurfaced soon after, with vulgarity-filled tirade against the Madras high court and Tamil Nadu police, accusing them of being anti-Hindu and controlled by Christians, at a meeting in Pudukkottai that was caught on video. This second incident lead to a suo moto contempt of court charge and another attempt to beg forgiveness, only to be followed by further accusations of Christian attempts to control Tamil Nadu when actor Vijay played a role that was critical of the government in the film Mersal. The BJP-AIADMK team’s “star speakers” in this election are in fact nowhere near as talented as earlier generations trained in the neoclassical arts of Dravidianist oratory. Palaniswami clumsily asserted his own background as a farmer and listed the schemes that had been delivered by the BJP, while poking fun of the Congress candidate, Karti Chidambaram, claiming that constituents would have to take a flight to Delhi if they ever wanted to meet with him. The chief minister also tried to project the MLA from nearby Viralimalai, health minister Vijaya Bhaskar as “Jallikkattu Nayakan,” nodding to the large sporting event he sponsors in overcompensation for the lack of public interest in the AIADMK’s stance when protests rocked the state. As for Raja, who was waving a Narendra Modi sign, in the words of someone who attended out of loyalty to MGR’s party, “It’s a good thing he didn’t open his mouth and speak. Otherwise, garbage would have come out.” Mentions of Modi’s name drew no applause. 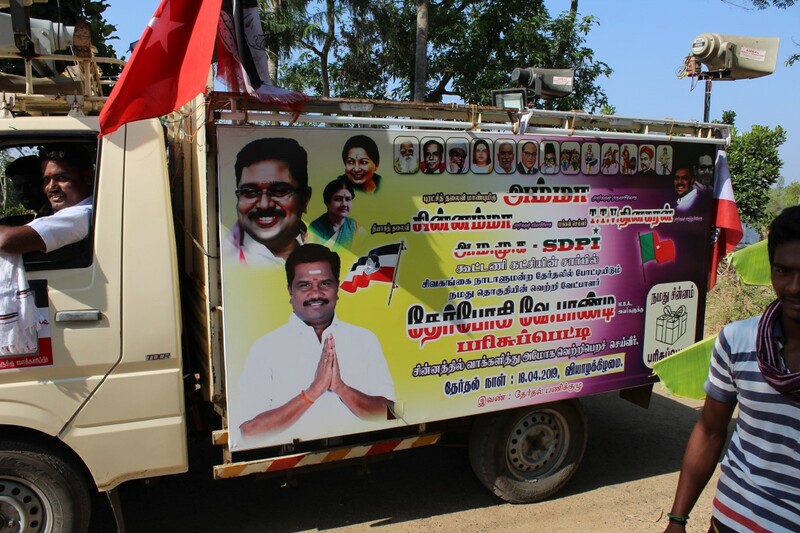 What the BJP-AIADMK led alliance appears to have lots of, though, is money. The afternoon following the Alangudi rally saw this constituency host BJP president Amit Shah, who arrived by helicopter to Lena Vilakku, an otherwise nondescript row of tea stalls along the Thanjavur-Sivaganga highway. As I pulled up to the massive gathering in front of a small temple, an MGR impersonator could be seen with whip in hand, dancing to the song ‘Naan Aanaiyithal’ from the classic 1965 film Enga Veettu Pillai in which MGR flays an abusive rich landlord. 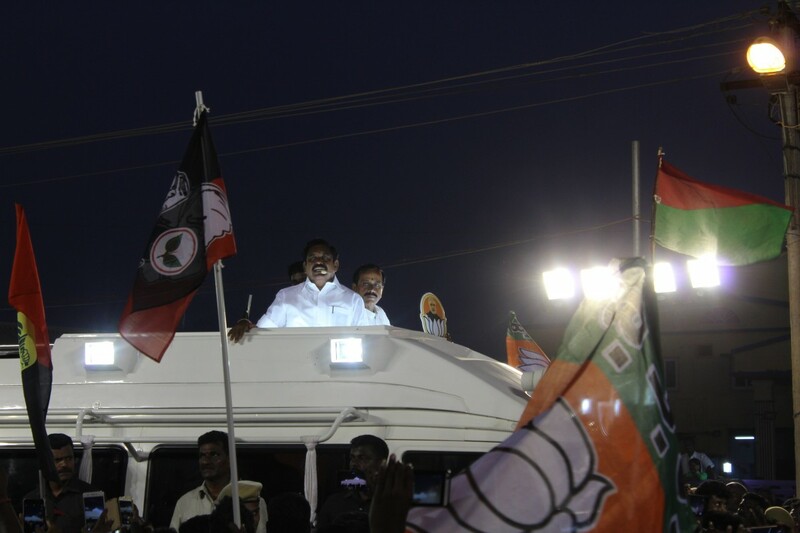 H. Raja and E. Palaniswami campaigning. Great attendance was assured by busing in villagers, mainly women, by the thousands in carts normally used to haul goats or soda bottles, promising everyone Rs 200 for their troubles. But the joy of seeing their childhood star impersonated before a field of lotus flowers appeared unable to sustain interest in what followed. By the time Shah took to the stage, seats under the giant shamiyana that had been erected to protect attendees from the searing summer sun were more than three-quarters empty. Only a hundred or two hard-core BJP supporters stayed to hear him speak in Hindi about national security under Modi’s watch, with H. Raja translating into Tamil. On the other side of the national contest, former Union minister P. Chidambaram’s son, Karti Chidambaram, was only given the Congress ticket in alliance with the DMK and Left parties after winning an internal battle with another former Union minister, E. Sudhasana Nachiappan. The senior Chidambaram would later claim that the delay in sealing his son’s position for this seat was because Rahul Gandhi was considering contesting from Sivaganga. Both the DMK and the Congress’s penchant for family politics have provided their opponents with a great deal of speech material, as they project Modi as a candidate unfettered by the ties of kinship. According to a number of people I met in the Chettinadu region, many in the Chettiar community are unhappy with how Karti’s well-known father has handled relations with his fellow caste members. They will be voting for Raja instead. Karti only won 10% of the vote against the AIADMK candidate in his first innings from his father’s former constituency in 2014, and despite the number of investigations suspecting him of money laundering through his sprawling business empire, people I talked to are for the most part indifferent. There is little sign of active dislike, as there is for Raja. In a crowd-pleasing comedy set skewering the Modi government’s record by the allied CPI(M)’s arts troupe Pudukai Poobalam performed outside Alangudi, for example, they barely mentioned Karti, other than to note that he was a necessary force in the fight against fascism. 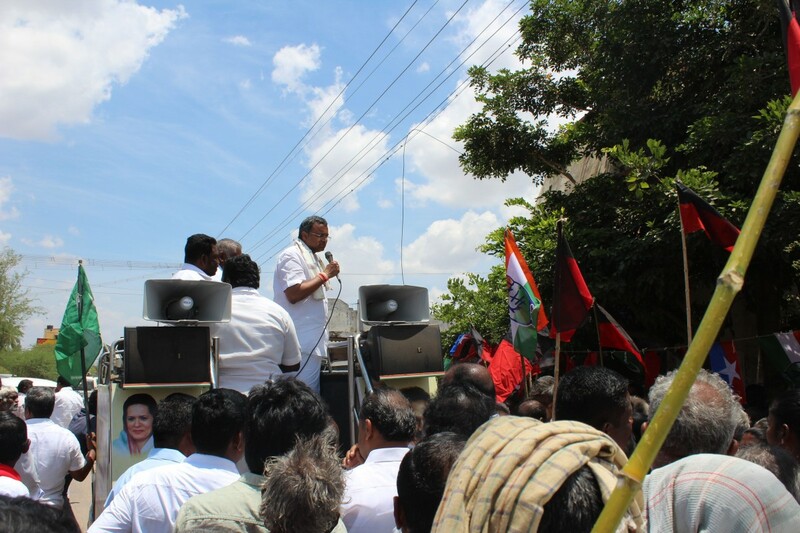 When I caught up with Karti, he was in the midst of grassroots campaigning in the village of Karaiyur, deep in the dry scrublands of Chettinadu. Nagore Hanifa’s well-known devotional odes to the DMK and Kalaignar M. Karunanidhi were blasting through the air as the candidate’s car pulled up to the sound of bursting crackers. Shaking hands with local party cadre from the DMK, Congress, CPI(M), CPI, Indian Union Muslim League and the VCK (Liberation Panther Party), Karti walked up to stand on the back of a speaker-loaded cart to give his speech in the noonday sun. Comparing the BJP’s strategies of communal mobilisation to a virus, his speech was focused on the theme of unity and equality across castes and religions. Karti told the stories of how his tennis teacher was Muslim, and how his family used to receive cakes at Christmas time, as examples of his idea of India. These stories, though, were awkwardly directed at an audience that does not play or watch tennis, and almost certainly has little experience with personal sports trainers. He then asked which serials the women were watching, naming the popular ones, only to hear from a woman in the crowd, “I watch the news!” This was meant to be an opener for how Congress had vowed to lower cable television rates. Affable, if defined by the somewhat distant comportment of his socioeconomic class, Karti assured the crowd that they could come to him for anything they needed, from a recommendation to larger development projects. Karaiyur’s was not a paid crowd, however, as this was only a short stop in an out-of-the-way hamlet. After his speech, the candidate stepped down to speak with members of local self-help groups, emphasising Congress’s commitment to “women, farmers, and youth,” before returning to his car and moving on to the next stop. Many traditional DMK voters I asked here and elsewhere simply said they would be voting for “kai sinnam (hand sign)” with almost complete disregard for the candidate himself. People are unhappy with both the national and state governments. Despite his limited personal appeal, Karti’s party still appears to be emerging as a winning bet where voters are unlikely to stand for attempts to divide them along religious lines. All images by Francis Cody. 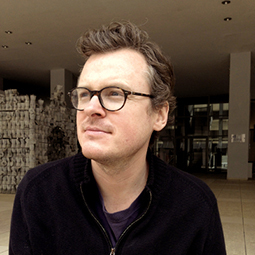 Francis Cody teaches at the University of Toronto in the Department of Anthropology and the Asian Institute.